Every heating oil season we receive a number of enquiries about how to identify and remove water from domestic oil tanks, normally when the attached boiler has started to play up. 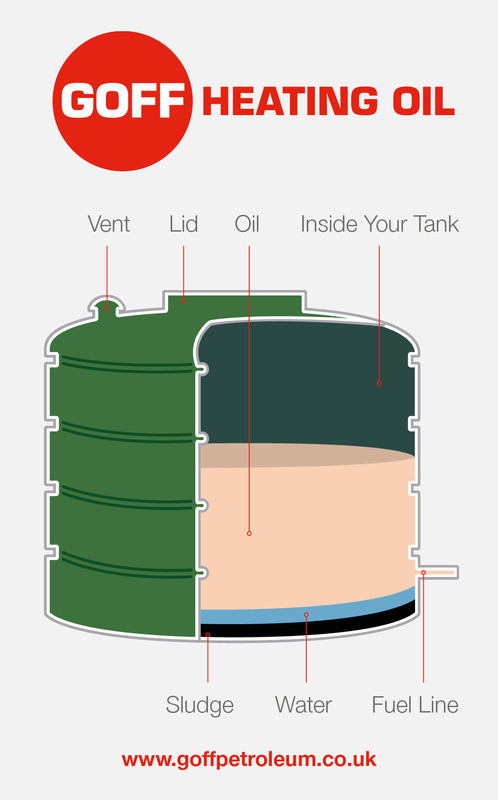 Water can get into your home heating oil tank in a number of ways; rainwater ingress due to an ill-fitting filler cap, lose inspection lid, corroded seals, damaged vent, a split or hole in the tank or the normal itself, or more regularly through condensation build up. As outside temperatures warm up, oil tanks experience greater temperature fluctuations which will pull moisture from any air inside your oil tank and cause condensation to accumulate on its inside walls. Unshaded outside tanks that take on direct sunlight are especially prone to condensation. The problem is however that whether the water is from rainwater contamination, or condensation build-up, it is all but impossible to detect from an external inspection alone. Any water that has found its way into the tank will sink to the bottom. This means it can’t be seen and removal is therefore difficult. Often, the first someone knows of their tank being contaminated is when they start having problems with their boiler or Aga that the tank feeds. How to detect water contamination. If you suspect that you might have water is in your heating oil tank, or you want to test it for peace of mind, then with the right equipment and a bit of know-how, it is an easy job to do. Hopefully your heating engineer is doing this for you on every service, but if you suspect not, or haven’t seen seen him for a while then you can easily do it yourself. You will need some water finding paste (readily available on the web) and a long stick, such as a clean garden cane, that will reach all the way to the bottom of your tank. Simply smear the paste to one end of your stick and put this end into the tank. Lower it all the way to the bottom, keeping hold of the top end so you can easily remove it. Wait for the time period given on the instructions and pull it out. If the paste has changed colour, then water has been detected and contamination is confirmed. How to remove water contamination. After you have checked your fuel and have found water, it is really quiet important to get rid of it as soon as you can before it gets into your boiler or Aga and causes damage. If your heating oil tank is a metal construction you will find you probably have a sludge valve at the bottom of the tank which you can use to drain off the water. If your tank is plastic then the water needs to be “lifted” out and depending on the amount of water you have you may be able to use a water absorbent tank sponge for small volumes or have the water removed with a pump. Remember that whatever method you use the water cannot be disposed of down the drain. To dispose of it properly it will need to be taken to a local authority waste disposal site with a waste oil collection tank. Under these circumstances we would recommend an OFTEC engineer do the job, as you may also need to have the boiler feed pipe flushed and the fuel filters changed once the water has been removed. How to reduce the potential for rainwater contamination. Hopefully you have found this Goff Heating Oil how to guide useful and now feel more confident about keeping your heating oil tank free from water and protecting your boiler or Aga from damage. Keeping a regular eye on your tank is probably the best way to ensure you have problem-free home heating, and with the weather still proving to be as unpredictable as ever, it is definitely worth the effort. If we can help you with any other queries or if you have an idea for a how to guide you would like us to write then please do not hesitate to contact us.